Pure Football is a case of “does what it says on the box”. Pure Football. Football at it’s purest. This means football stripped back to basics, the essentials, the raw materials. As such, the game is done in a 5-a-side format, with no referee, and as a result, a lot of the rules you would associate with a referee disappear. No referee means no offsides, no free kicks and bookings, and no fouls to a certain extent. I say ‘to a certain extent’ as there is a system in place, in the form of a foul meter. When this fills up from a team committing too many bad tackles, it equals an instant penalty for the opposing team, no matter where they are on the field. To add to the purity and to support the rawness of the game, Pure Football has been given an urban feel. This urban feel is outlined through the grounds you play on, with an example of one being ‘The Factory’, a pitch located inside an abandoned warehouse. Gone are the large stadiums, as are the bustling crowds along with the commentators. Some will see this as a welcome change, not only for the lack of the crowd, which at times in other games can be off-putting, but for the loss of commentary, which you soon learn off-by-heart if it is included. Already, you must be realising that Pure Football isn’t your traditional football game. Well, there’s more. To coincide with the ‘Pure’ theme running through the game, there is ‘Pure’ section of your shot meter, indicated by a white zone, as well as 2 pure bars along the top of the screen, one for each time. The first of these features, the Pure part of your shot power meter, is a small white zone which, if you manage to hit by holding down the shot button for just the right amount of time, will cause your player to drive a seemingly rocket-powered shot goal wards. This shot is known as a ‘Pure shot’ and, as you can imagine, is much more effective that standard shots. A ‘Pure shot’ is shown in a satisfying slow-mo/time stop style, and if shot from an appropriate range, is almost a guaranteed goal. The second of these features is the pure power bar which stretches across the top of the screen. Each time you do something deemed to be ‘good’, such as hitting the post or a saved shot, this bar will slowly fill up. When it is completely full, the next shot you take will be a ‘Pure shot’, no matter how long you hold down the shot button. After you have taken your shot, the Pure bar along the top will drain back to empty whether you scored or not. This method of obtaining Pure shots is very effective, and if you are controlling the match well, you will earn plenty of beneficial extra pure shots as a reward. This display of strength through the powerful Pure shots is reciprocated in the physical appearance of the players. 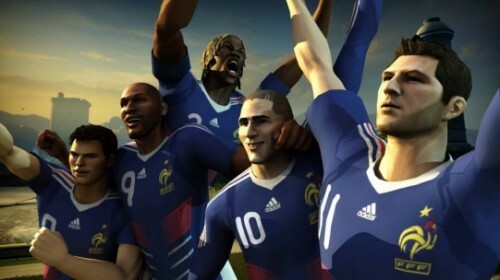 Ubisoft clearly haven’t gone for realism, shown not only by the super-powered shots, but by the fact that the in-game players resemble caricatures of their real-life counterparts, more than the real thing. 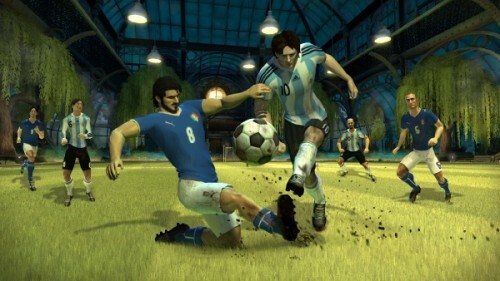 The graphical style certainly isn’t unique, as it was already trialled in EA’s ‘FIFA Street 3’, and in comparison , Pure Football is actually a more toned down version of this, despite the emphasised muscular structure of the player’s bodies. With all this taken into account, it works quite well and adds to the arcade feel that Pure Football emits. In regards to play modes, there is a fairly standard array of choice; from ‘Exhibition’ and ‘Quickplay’ for some instant action, either single player or local multiplayer; to the ‘Campaign’ section which links into the section were you can create your own player; on top of the Xbox Live compatibility. 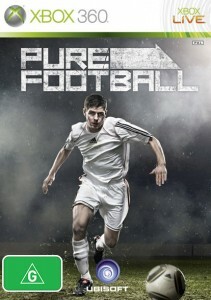 As a single player experience, Pure Football allows for both brief and extended periods of play, depending on the preference of specific players. The ability to tamper with the settings, like being able to adjust the duration of the match, grants this flexibility. 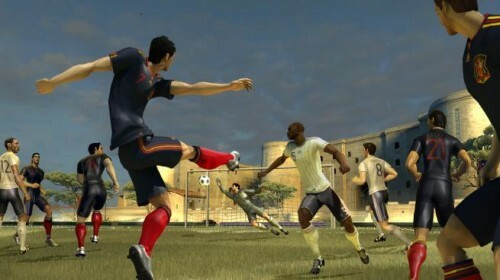 Even the Campaign can be played in short bursts, due to the “one match at a time” structure, which is complimented by the game’s autosave system. The Campaign mode is long enough to be substantial, but short enough to make repeated playthroughs plausible, and an abundance of unlocks means there is plenty of reason to do so. The manner in which you unlock players is neat and quirky, completing challenges as you play against them in order to unlock them for transfer, at which point you can purchase them with Pure Points earned in matches (PP are the currency of Pure Football). Unfortunately, the Campaign can be completed with ease on the lower difficulties, with the aim of being number one in the world achievable in half the allotted time. 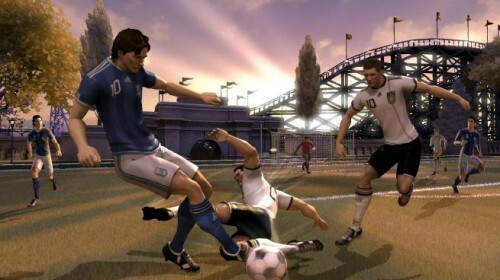 The fact that there is a range of difficulty, when combined with the arcade style of the game, means that Pure Football accommodates for less experienced gamers. But, for more experienced gamers, once you have picked up the controls, you will need to crank up the difficulty settings for this game to present any challenge. Even after the difficulty has been turned up, there is still the option to ‘restart match’ at the end of every campaign game. Although this comes with the consequence of a reduction in the bonus PP earned, this repercussion does not seem significant enough to discourage players from overusing this feature, meaning the campaign gets even easier. Multiplayer is enjoyable, mostly due to the fact that it is much more fun playing with someone human, instead of the computer. This is partly because the AI is so unreliable though, especially the goalkeeper. This could be to encourage initiative in gamers, and cause them to make crucial decisions for themselves, but either way, the goalkeeper is a liability and you will need to take over from the AI goalkeeping decisions if you want to avoid silly mistakes. As far as Xbox Live goes, there is the ‘Transfer Market’ where you can spend your hard-earned PP to compile the squad of your dreams, as well as typical one versus one matches online. Local Multiplayer is malleable, with up to 4 players able to collaborate with each other in a variety ways like 2 on 2, 3 on 1, or even all 4 against the computer. Local Multiplayer also benefits from a zoomed out viewpoint, in stark contrast to the behind-the-player perspective seen in single player. It brings me to wonder why this zoomed out view wasn’t integrated throughout the game, as it certainly works a lot better, allowing you to clearly see all the passing options, as well as get a feel for the size of the pitch. Another frustrating aspect of the game is the constant stoppages. With the removal of the referee, stoppages like free kicks, offsides, bookings and substitutes have also been ousted. There aren’t even injuries! However, in their place, there are all kinds new, irritating stoppages which destroy every shred of momentum, and in turn, make the game feel very stop and start. For example, when there is a penalty the game’s progress halts as the game seems to initiate a penalty mini-game. If the keeper manages to parry the ball away, play doesn’t continue as it would in a real game. There is no chance for the striker to have another try on the rebound. Then there is also the goal celebrations. As goals are frequent in Pure Football, the dark celebration screen popping up each time gets annoying and further interrupts play. They make the lengthy break in play from the instant replays (which, to be fair, are usually nice to watch) even longer, unnecessarily. In summary, Pure Football offers an alternative spin on the ultra-realistic and technically accurate football/soccer titles on the market. It’s arcade style, with the super-powered shots and only a few basic rules, mean it can appeal to those who aren’t necessarily football fans, but are fans of games. At the same time, this inaccuracy could put off dedicated football fans, who may find the fantasy aspects on top of the lack of rules, too extreme. Whilst FIFA and PES remain unthreatened by this game as they bask in all their official and licensed glory, dwarfing Pure Football’s meagre arsenal of 20 teams and 230, street/arcade football has a new front runner and it’s name is Pure Football.